Although I have transitioned from Decision Free through Healthy Solutions and from Phase One into Phase Two, I still find shakes to be an important part of my daily life. A blended shake with an HMR 500 packet is only 100 calories but is incredibly filling for a relatively long period of time. When I was in Decision Free, I couldn’t imagine that I would still enjoy and drink as many shakes as I do, but I am still playing with recipes and enjoying shakes and mousses! This shake is inspired by two classmates who transitioned to Phase Two when I did. I can’t believe it took me this long to hear about their Butterfinger shake but with some easy alterations, I made my own. Their shake used SF FF pudding which I don’t keep in the house due to the sweetener used, so I needed to figure out my own version. They also add Molly McButter for some extra butter and salt but I didn’t for mine. This ratio blends enough in my Vitamix to fill my venti double-insulated Starbucks cold cup to the top. Blend all ingredients except the ice on low to dissolve the powders. Add ice and blend on high under smooth and fluffy. Enjoy! I lived inside of a bubble for almost a whole year. It wasn’t a real bubble. That would be a little bit strange. But it was a world where I had protection in the form of a very strict diet called HMR Decision Free. For those who have been reading for awhile, you probably already figured that out. But it still amazes me that for a whole nine months, I lived in such a confined world of food choices and after so long inside my bubble, I think I had forgotten what existed outside of that world. Cornell researchers Brian Wansink & Jeffery Sobal found that we make more than 200 decisions about food every day. While we learned about this study in our HMR health classes, I dismissed it at the time, because those were not choices I needed to make at that moment. My choices were much more limited. Did I meet my daily minimum of shakes and entrees? Which of the limited selection was I eating next? Since everything was tasty and nutritionally calculated, it was rare I really felt compelled to make a clear decision. When I transitioned to Healthy Solutions, the number of decisions increased. Suddenly I needed to decide how to get my fruits and veggies in. I needed to go into grocery stores to acquire said produce. I needed to prepare them and write them down and it became more complicated that just jotting down the same several items in my journal each day. And because I thought I missed variety, I quickly delved into produce diversification. However, perhaps I should have stuck with buying only what I needed each day to minimize choice and over-consumption. Pierre Chandon and Brian Wansink found, in the Journal of Marketing Research, that stockpiling food leads to over-consumption. And so while I thought I was saving money and time in buying in bulk, I have since realized that I consumed even more produce just because it was there, not because I was hungry. Fruits and vegetables are not the worst things in the world to overeat. However, the habits created could possibly transfer to other items. And so by discovering this in Healthy Solutions, I was able to minimize the total amount of food in the house and as I transitioned to Phase Two, I had to keep this in mind. Because even frozen dinners, that would soon supplement my HMR meal replacements, could be abused. As I have transitioned to Phase Two, I have worked hard to keep my home environment and work environment as clean as possible. But I have learned a lot in the transition. I learned quickly that I couldn’t be trusted to just show up in the school cafeteria to select a meal on the fly. The temptations of everything around me would add up. And even if I grabbed small portions of lots of healthier options, it would still add up to way more calories than I needed in a meal. And because I was now socializing at lunch instead of eating in my classroom, I found that I consume far more despite the fact I could have done with less. And I am not alone. According to John M. De Castro, a professor at Georgia State University, in the British Journal of Nutrition, “Simply eating with one other person increases the average amount ingested in meals by 44% and with more people present the average meal size grows even larger.” And so I either have a shake about an hour beforehand and strategically plan which stations I will go to and which I will avoid, or I bring my own meal and bypass the cafeteria entirely. The social pressures to consume “normal food” have led me to stray from guidelines we are encouraged to follow in Phase Two of HMR. While traveling, I worked to fill my plate with mostly vegetables. I used shakes and produce and entrees to offset hunger, and I walked when I could. But eventually, I found myself caving to the pressure to consume the “special homemade meals” that were offered near where we were sitting. The food was free and the families were so eager to share. And it was delicious. But I have struggled to pull myself back into real life day to day living. It is so easy to justify everything as something special. And yet I lived for nine months where nothing was special enough to eat and I had a few events that probably were once in a lifetime events where I resisted! While I had some trouble with motivation during some of my initial weeks in Phase Two, I think my health educator helped me assess what a bigger problem was for me. I still hadn’t figured out what my new box was. I had done so much work to stay in the HMR defined box, and now that I “could have” things, I was having them because there wasn’t a box I had clearly laid out. In the past few weeks, I have figured out my triggers. I also know that severely limiting myself forever won’t work, and I do need to eventually allow for life events to happen. But I also need to write out a box for myself that I can stick with day to day. I am writing out my Phase Two box here. In published form. To hold myself accountable. While I know that eventually it may change, this is how it need to be for the moment. In order to continue my weight loss efforts and prevent the Gap from consuming me. I will continue to allow shakes and entrees be a part of my life. The definition of a meal replacement being 300 or fewer calories with more than ten grams of protein. I will allow myself one bar a day but bars must be under 200 calories with at least ten grams of protein and cannot be consumed in my house (in other words, bars should be used as portable meal replacements when necessary, not a daily requirement). I will continue to enjoy fruits and vegetables as these are important for my nutritional health but also to practice “more is better” with. And I will limit myself to no more than one serving of lean protein outside of prepared meal replacements each day. Finally, I will allow myself no more than 200 “other” calories. This might be popcorn. It might be a small cookies. It doesn’t have to be limited in scope (variety) but it does have to be limited in magnitude (calories) and I must ask myself “is this worth it? will it keep me full? if it won’t, why am I eating it?” and if I am satisfied with the answers, I can have it. I was asked as I transitioned where I saw myself in five years. What is my five year plan. And the truth is, I am still thinking about it. But I know I don’t want to regress. I want to move forward. To better understand and support my health with healthy behaviors. And I will continue to contemplate this as I learn to live inside the box again. The white board has returned. And I look forward to building up those numbers because I am #HMRStrong! With debate season in full swing, I have a lot of posts I have started and finding time to finish them has been difficult! I remember how frazzled I was last year at this time and I didn’t have to try to fit in physical activity and meal planning then! 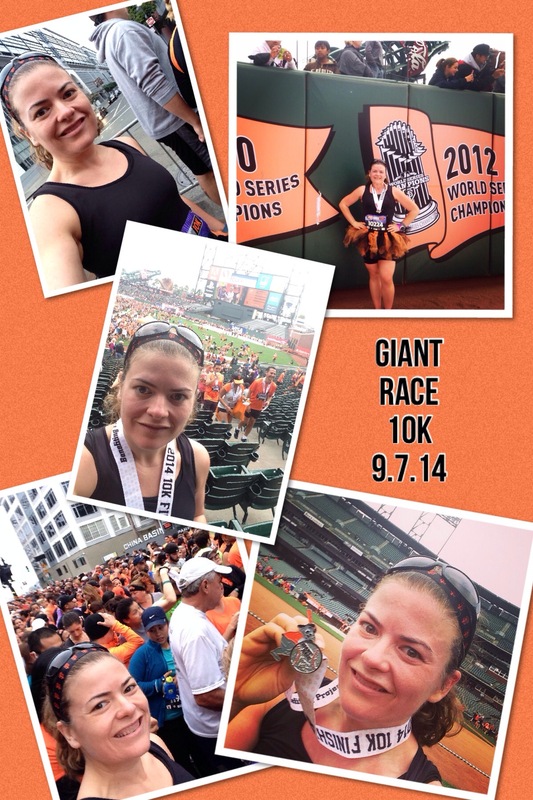 The Giants 10k was part of a series of races celebrating running, community, and the San Francisco Giants franchise. I ran the San Jose Giants 5k in June and completed the “turn two” challenge to ear a special pair of Giants earbuds. The 10k was held the same day as a half and a 5k. I opted to sign up for the 10k because the Disneyland Half was the weekend before and I signed up in the spring, before I had done many races. So I wasn’t sure how well I would be conditioned. I opted to raise money for Project Open Hand instead of just paying the race fee. This gave me a unique purpose for the race and it ended up becoming something bigger than just a 10k. I think this organization does awesome things for our community and worked to raise far more than the minimum required. I apparently raised enough to even have access to a special lounge at the race. I have to admit that having a warm place and private bathrooms was a luxury I could definitely get used to having! Because I registered early enough, I had my bib and shirt mailed to me. This meant not having to drive up to San Francisco for the race expo. While I missed exploring all the fun the expo, I definitely appreciated the convenience. The 10k had a combined start with the half and released in several waves. There were lengthy breaks between each wave which kept my nerves building as I had listed a predicted finish time that had me in one of the last corrals. Just as I had realized the weekend before, I knew I would be doing some weaving based on where I was starting. I had decided I would try to push myself as long and as hard as I could. I had a secret goal in my head but I was scared to share it because I didn’t know if I could take my sub-30 5k time from mid-summer and go sub-60 with double the distance. And I was going to be okay if that couldn’t happen. But I figured I would try. The course was incredibly crowded and there wasn’t enough room on the street to sort everyone out. I ended up on the sidewalk for a significant portion of the first couple miles. I felt bad for the poor pedestrians but people were walking three and four across and there was no way to get around the large groups. Rather than get angry, I just worked my way through. I definitely expended a lot of energy weaving but I let it go and just enjoyed pushing myself. I was shocked when I looked down at my Garmin and saw my first two miles were under a 9:30 per mile each despite the weaving. And as I started to assess myself, I knew I could push a little faster. At the turnaround I suddenly found myself facing the massive pack I had been weaving around. The lanes were so narrow that I ended back up on the sidewalk to avoid running head first into the masses spilling into the return lane. I pushed through mile four with sheer force but when the road opened up more in the last two miles, I felt some of that energy go away. Suddenly I wanted to slow down. I had proven I could go fast but my body wanted to chill and take it slow. I began to review why I was running. Why had I started running (for my health) and why I raised money for this run (to help the health of members in my community). I started crying (which doesn’t mix well with sweat and sunscreen and contacts!) and I seriously felt the invisible hands of all of those friends who donated to support this cause were pushing me forward to keep up my pace. I RAN A SUB 60 10k!!!!! The finish line was on the field and once you finished you could stretch out on the grass before picking up a variety of treats on your way out. I enjoyed the fruits and veggies and then went back to the lounge to rest and watch the 10k and half finish before going out to cheer for a friend doing the 5k. I also signed up to raise money for Project Open Hand again in 2015. And this time I am running the half! I have a number of things I want to write about. But I promised myself I would write about this first. And I clearly didn’t want to write it. So I didn’t write. But a quotation from the 90’s TV series Dawson’s Creek kept running through my mind these last two weeks as I contemplated what I would write. And while that quotation may not exactly fit, it does a decent job summarizing what occurred after 312 days of being “in the box” on the HMR Diet. That’s right, I went out of the box. I could make a dozen excuses. For example, I was beginning the transition to Phase Two and introducing outside foods already. But after two weeks, I have come to realize, I was just tired of doing it right. And there really isn’t an excuse for it. But there is a lesson. I was in New Haven for a debate trip and had done everything right all weekend. My students went to Shake Shack, and I went to Subway for a veggie lover salad. I met with some coaches at Buffalo Wild Wings and ordered a plain garden salad w FF dressing on the side. I made myself run in the middle of the day around campus while my debaters were in a round so I could fit in PA. And I had even planned team dinner at a place I could find supportive food at and had something to eat before we went so I wasn’t starving. What I didn’t predict was a special event at the restaurant that would force us to alter our plans. And while we walked past several pubs and fried food joints, my mind was racing. So when we happened upon an Ethiopian restaurant, all I could think about was the fact I knew they would have vegetarian dishes. After explaining to the kids what various dishes were and making recommendations, I went to order my own. I got the vegetarian combination and selected three items that seemed to only have lentils and vegetables and spices. I asked for no butter but clearly forgot to say no oil and no bread. The waitress said “oh don’t worry, it’s vegan” and I didn’t respond. I didn’t explain my diet like I had been doing so carefully. I was tired. Tired of explaining things. Tired physically because of travel and chaperoning. And honestly tired of feeling constrained. I was a negative nancy if ever there was one. And so when the dish came out clearly cooked in oil and served on the injera bread, I ate it. I savored it. And later that evening, I got really sick. Am I sorry I left the box? In short, yes. Not because the whiteboard would be erased. But because I knew better and I chose to leave the box and eat unsupportive food. Diet fatigue is real. But knowing I can make choices is also real. And as I have transitioned into Phase Two, I am forced to make more and more choices. Most have been good but some have not. This is going to be a long process but I can take the lessons I have learned in Decision Free and Healthy Solutions and apply those in Phase Two. So what would I have done differently in New Haven now that I have had time to reflect. First, I would have stopped outside of the original restaurant and asked the kids what they wanted. Most of them would have probably been okay ordering a couple of pizzas and hanging in the lobby. Which would have allowed me to just have another shake and some fruit that was in my hotel room. Had they wanted to go out, I could use the mobile apps I had used to find the first place to find a new one that would be just as supportive. A couple of minutes of thoughtful planning could set me up for success. Third, I should have consumed a glass of water at the restaurant and reflected and just taken some deep breathes. I was tired and stressed and anxious all at once which left my judgement cloudy. Fourth, I should have ordered off menu. Some steamed vegetables would have been tasty without the stomach ache. And thoughtfully explaining my diet might have allowed the server to make suggestions. Finally, since I have transitioned, if I had wanted a special meal that was a little more indulgent, I could have planned ahead for it. Maybe a small indulgence would prevent a larger one in a world where boundaries are becoming less strict with an even higher level of self-accountability. 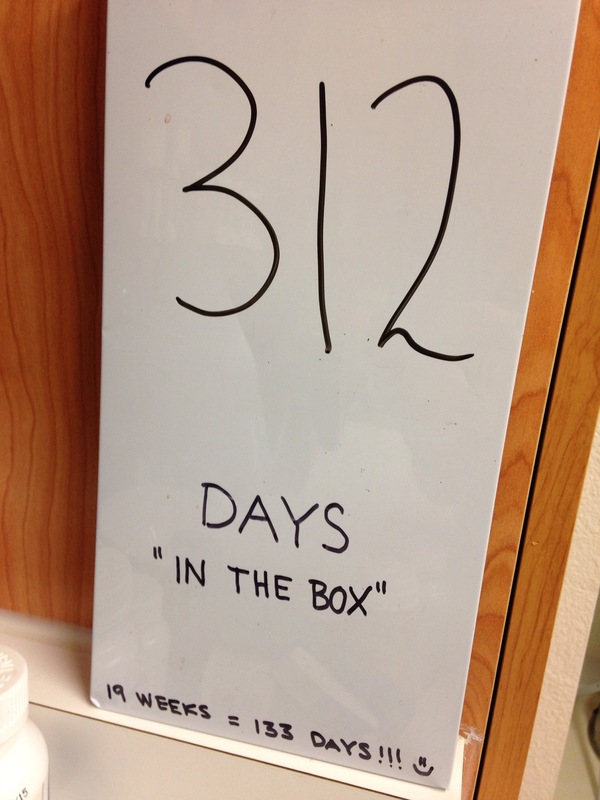 I am proud of myself for the 312 days I stayed in the box. It is proof to me that I can stick with something. It is also something that will keep me in check because I know how hard it was. I lost a lot of weight very quickly which has been hard to process sometimes. But every day was a struggle and I know it will continue to be a struggle. But learning from those struggles is the only way I can recover from the mistakes I make. Then I just have to stand up, dust myself off, and get back in my own Phase Two box.